Yanks bounce back just fine from Red Sox sweep. 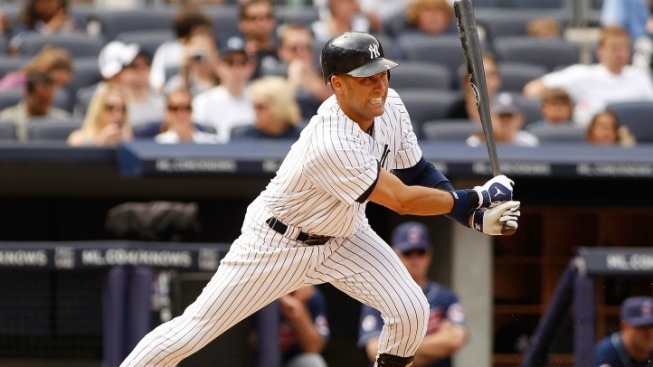 Derek Jeter's 3,000th hit will push the Sox sweep further into the past. There's an old joke about places where storms and sunshine can come and go in the blink of an eye: Don't like the weather? Wait 10 minutes and you'll have something completely different. The Yankees don't have their own weather systems, although we're sure Big Stein thought they were deserving of one, but you could tell a similar joke about this year's team. Over the last seven days the team has gone from west coast conquerers to Boston's lackeys and back to chuffed after a weekend of laughers over the Indians. What to make of this wild fluctuation in results? The fact that the baseball season is a very long one comes to mind, making it advisable not to get too up or too down about any small batch of results. More specifically to the Yankees, though, is the fact that their struggles against the Red Sox this season have done a lot to mask their overall strength as a team. They are 1-8 against Boston and 35-19 against everybody else, marks that bode pretty well for a future featuring a lot more games against everybody else than against Boston. This weekend was a perfect example of how well that works out for the Yankees. Three games against a first place team that saw the Yankees look like a juggernaut with strengths everywhere instead of the team that looked so meek in their battles with the Sox just a few days everywhere. Freddy Garcia danced around danger into the seventh inning on Sunday, showing that his low-octane stuff can still work against American League opposition that isn't stocked with All-Stars. The 9-1 win also featured 18 Yankee hits -- not one of them a homer -- to remind you that there's still some life in those old bats. One of the liveliest bats of the weekend belongs to Jorge Posada, of all people. The much-maligned DH has 13 hits in his last 22 at-bats, jacking his average up 57 points and giving some reason to believe that there's still reason for him to be getting regular turns in a big league lineup. Anything close to that kind of production over a long period would make the Yankees that much more dangerous offensively and it also creates some renewed hope that Nick Swisher will start hitting again at some point. Not a bad place to be for a team that's already second in the league in runs. Yes, there are real questions about the bullpen and the rotation in light of injuries to Joba Chamberlain and Bartolo Colon. There were already real questions about the pitching, though, and the Indians series has driven home the point that there's time to figure out the answers. In baseball and almost all other things, quality is a relative state. The Yankees have fallen way short against the Red Sox, who only got scarier by virtue of outscoring the Blue Jays 36-5 in Toronto this weekend, but they've made it equally clear that they have an edge on the rest of the American League. They'll have to deal with that Red Sox issue down the road. Until then, calm has been restored in the Yankee universe. Josh Alper is a writer living in New York City. You can follow him on Twitter and he is also a contributor to Pro Football Talk.